I received an Email from a Mac user who tried Ubuntu using Parallels Desktop 4.0. 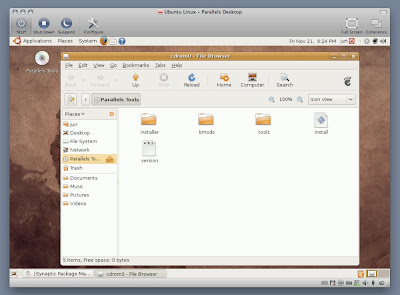 He has successfully installed Ubuntu "Intrepid Ibex" as guest OS, but he wanted help in installing the Parallels Tools. If the Parallels Tools is installed, you can get plenty of add-in features like automatic mouse capture and dynamic screen resolution adjustment, so it can greatly enhance the overall usability and performance of the guest OS. Step-1. 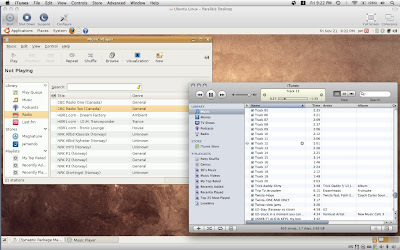 Start Parallels Desktop for Mac, run Ubuntu and login. Step-2. 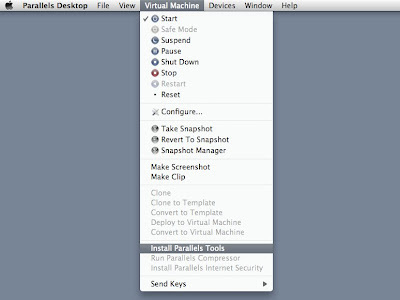 Once logged in, go to Parallels Desktop menu then click on Virtual Machine --> Install Parallels Tools. Step-3. A prompt will appear. Just click "Continue" to mount the CD-ROM drive. Step-4. 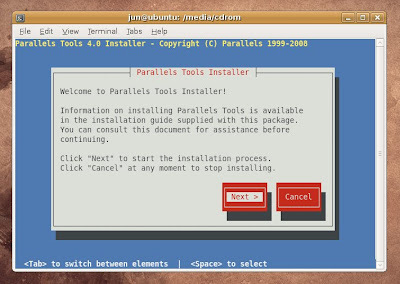 Using the terminal in Ubuntu, open the Parallels Tools Installer. 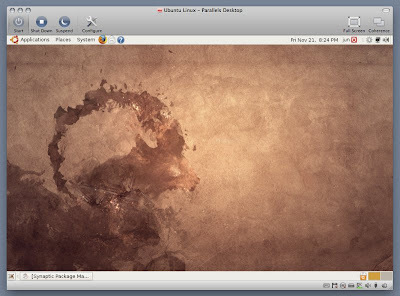 Currently, there's still no OpenGL graphics acceleration support for Linux in Parallels Desktop 4.0. Anyway, you can still enjoy Ubuntu, and try its unique features and wide selection of great open source software applications. when i want to use terminal ,terminal window close immediatel. what should i do? Oh my God!!! Thank you so much!!! It doesn't work. Terminal answer me "Permission denied". What should I do? After installing the Parallels Desktop 4.0 build 3810 update AND reinstalling Parallels Tools the dynamic screen resolution stopped working. Has anyone else experienced this? Use your user password.. You now are "root" account permissions. Retry the install. Marvelous, worked perfectly in 8.04 as well. 2 simple commands - why the heck couldn't Parallels provide these simple instructions???? Hours wasted with long unnecessary, overly complicated and non-working approaches. MANY THANKS!! Thank you so much!!! Finally someone who actually knows what he's talking about!! Simply and fast....Thank you mate!!! Still no 9.04 support? Should I downgrade to 8.x.x? Darn! I already installed the current version of Ubuntu on Parallels without that knowage. I guess I'll just keep that virtual machine without a use until the Parallels team releases a newer version of Parallels Tools. What garbage. 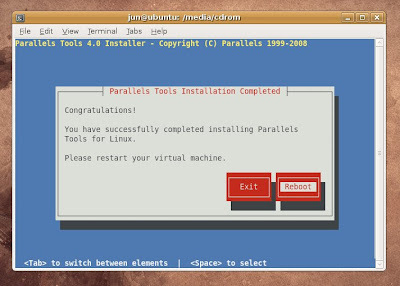 Parallels (4) tools install simply fails on Ubuntu 9.10. I’m using Parallels Desktop 5.0.9344 and Ubuntu 9.10. Mine was also in cdrom1. great post though, thanks for the help! 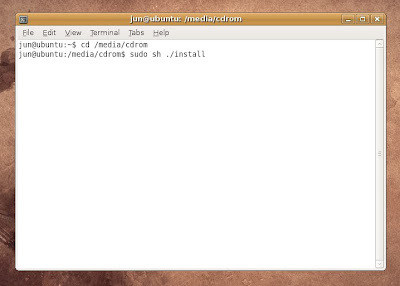 Anybody got this working for ubuntu 10.04 on Parallels Desktop 4? I cant even mount Parallels tools on Ubuntu. Parallels Tools mounted after reboot, but nothing happens after "sudo sh ./install". Simply returns to terminal prompt. No apparent activity. Does Parallels block installation on later versions of Ubuntu?